It’s two months since the coalition government was formed, what is the public’s opinion of it so far? Voting intention has followed a fairly straightforward pattern – the Lib Dem vote has fractured since the election, presumably largely due to losing the support of more left wing voters who object to the coalition deal, or to the agenda the coalition have been following. The Conservatives have increased their support to the low 40s, while Labour have moved up into the mid 30s – positions that have remained largely static over the last couple of weeks. In yesterday’s figures we showed a nine point lead, the largest since the general election, but unless that is repeated over the next few days the underlying picture seems to be random variation around a Conservative lead of about 7 points. While these figures are positive for the Conservatives (on a uniform swing they would be enough for them to win an overall majority), there is no sign of the sort of honeymoon in voting intentions that Labour received during their first months in power in 1997 when some polls put them at 60% or above. That said, 1997 was something of a historical abberation – no previous government had experienced that scale of honeymoon in voting intention polls either (many didn’t have any at all). Where there is an much larger honeymoon effect is in David Cameron’s own personal ratings. On leader approval rating Cameron is doing well – from 48% straight after becoming PM (when 40% said don’t know, reasonably enough), his approval rating peaked at 64% in mid-June and remains high at 58%. His disapproval rating has gradually risen over the last two months, largely as Labour supporters initially willing to give him the benefit of the doubt have shifted over to disapproval. His net approval rating is currently +28. Detailled perceptions of Cameron underline how the mantle of office has improved the way the public see him. His ratings on being strong, decisive and sticking to what he belives in are all up significantly. The quality where he scores the least remains “good in a crisis”, followed by being in touch with ordinary people, where he hasn’t really improved since the election. The only measure where he has dropped is on being charismatic – people are starting to Cameron as a strong leader, rather than just a charming one. 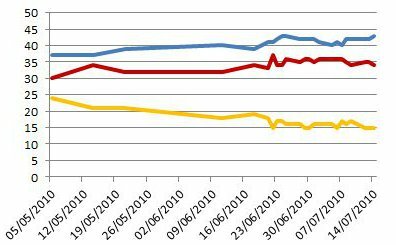 In contrast Nick Clegg’s figures have been on a downwards trend since the general election – this seems to be a continuation of the decline since the the peak of “Cleggmania” after the first debate. On some ratings, including honesty, being in touch with ordinary people and sticking to what he believes in, Clegg is now back to the sort of figures he got pre-debates. On other ratings like being decisive and charismatic he is still seem considerably more positively than at the start of the year. The only obvious cloud amongst polling for the Conservatives in the coalition so far was reaction to the VAT rise in the budget, which polls found a majority opposing, and falling economic optimism, with increasing proportions of people saying they expect to be worse off in the coming year. Despite that the budget overall was well received, and the polls show the public continue to have confidence in the coalition’s ability to manage the economy (50% think they managing it well, compared to 30% badly). We are heading towards the Summer now, traditionally a time when the political to-and-fro stagnates somewhat. While at some point the honeymoon will start to fade, barring a major crisis I wouldn’t expect any major changes until we get into the run up to the conferences and the crowning of the new Labour leader. Ah, but surely in our glorious new big society it the responsibility of you all to monitor you own and your neighbour’s dog-pooping. I’m slightly sceptical about the big society as I think that in the current economic climate there will be too much tendancy for people just to be concerned for their own troubles. I also feel that with the lack of economic resources to back it up, its passing the responsibility without the actual power to effect much real change. Meanwhile the central government will be able to wash their hands and say its all your responsibility now. But maybe the good citizens will prove me wrong. There will doubtless be some great examples of succesful initiatives (doubtless run by the people who would have made something work in any situation) which will be endlessly trotted out to try and blind us to how bad things are for the rest of us. Or maybe Monday mornings just make me extra cynical. When I worked I drove a Benz E Class or a BMW 330. Now I am retired I drive a Spanish Golf. Its to do with need and expenditure and income. If you cannot afford the luxury of every civic mod con you have to go without it. Because some daft Scottish bloke did all the wedge. Is this simple enough for you? Once again I refer you to Bryne’s “joke”. I usually enjoy your posts – but only when they are pitched at the subject matter, rather than being a personal dig. DEBT. We are going to loose a lot more than pooper scoopers and OAP chariots of fire. Its because we cannot afford these and many many other things. The wealth we had is gone and we must get over it. You people talk like spoilt kids, daddy and mummy have run out of money, sweeties all gone. I’m prepared to give the Big Society idea a chance. I’ve worked in the charitable sector and now run a private sector business and in both I have completed substantial amounts of work for the state sector, so I feel I have some knowledge of the best and worst of all three. In my mind there is no question that we have all too readily slipped into a frame of mind that immediately says ‘something must be done’ whenever there is a perceived problem, and that invariably means that the council/government has to act. In many ways I see this as an absolution of responsibility by the individual and community – we become highly passive, yet at the same time demanding ever greater service levels at ever lower taxation cost. Labour’s statist approach certainly helped this flourish in some ways, but can’t be blamed for creating the problem. Things like Asbo’s and NHS waiting time targets did help promote the idea that society demands certain basic levels of behaviour and service from individuals and state bodies, but overall their approach failed to stop the slide towards passive citizenry, albeit with some notable exceptions. Likewise the Tories Big Society will contain some good ideas, but probably won’t address basic issues like seeking a more appropriate working hours culture that enables greater involvement in collective social activity, breaking down the move to ‘selfish familyism’ where ‘my family’ becomes more important than ‘my community’ (as in the education sector for example) or tackling the media obsession with measuring success in terms of money and celebrity (can we have a smash TV programe called ‘V Factor’ where the public gets to see young people volunteer and do good things and vote on the winner?). If the Big Society is just a cover for government cuts, it will fail and I will oppose it. The government has to recognise that helping communities to help themselves needs a rolling out of cash and resources in many areas as much as a rolling back of state responsibilities. Those areas best served by civil society are in general those areas that need the least support, and they will pick up the Big Society idea and run with it. I want to see how the philosophy deals with the problem areas where disengagement is rife. Overall though, I’m with Jon Cruddas on this. The Big Society is a positive idea – or could be. Rarely do politicians come forward with anything interesting in terms of social development policy, and Labour needs to engage and shape thinking on this as much as the government. But we need to make it happen too – we are much more important than any politician. I doubt Cameron’s motives, but that doesn’t mean he doesn’t have the germ of a good idea. If it fails, it will be seen as his fault, but in reality it will be us to blame. I don’t know if you’ve seen that there is a new Chinese rating agency which puts more emphasis on wealth creating capacity and foreign reserves. AAA is given to Norway, Denmark, Switzerland, Singapore, Australia and NZ. AA+ for China, Canada, Germany and the Netherlands. AA for the US while UK and France fall to AA-. Obviously because it downgrades the West and upgrades China it is being questioned. Seems fair to me. Just come in. Who said I want to get rid of Letwin? If you recall, I support PR so expect to have people like him in the total represenatation. He and I know each other quite well and get along fine. Where did anyone get the idea I was socialist? The Big Society is Letwin’s idea, and like Cruddas, he’s a dreamer. A lot to take in Alec. Much of it I certainly agree with, or like you see definite benefits. The “my family” thing is a confusion to me, it fits very well with southern European thinking. Now whatever the faults of those societies, I dont believe mindless nihilism as per elements in these islands is one of them. Unlike some people I really dont profess to know the answers, but as you say if politicians have the stomach to tackle these things, let us see what comes of it. I have always thought if I where Labour Cruddas is the best bet. He seems to me a “good” representative of Labour and its core support. Oh well I am decidedly not Labour so what matter. Not with that name Roland, it’s worse than Balls. John’s dad changed his to Major because of it. I saw the Chinese ratings myself. I would say they are as accurate as any other and perhaps a bit more honest. However, you only have to read comments on this site to see a distinct group feel we are sitting pretty and this whole thing is Tory spin. The concept of squandering money on everything and anything is so ingrained that a down rating from AAA to AA is just propaganda to support the Conservative party. Anthony, when are we going to see a YouGov update please ? the rating Agencies exist for those who are too lazy or too stupid to do tehir own credit analysis. In my experience we have too many analysts busy copying each other’s work with no real grasp of underlying fundamentals. This is a problem that is exacerbated by financial engineering which divorces the credit instrument from the true risk. Much of what happens in this arena is “clever” – but is it intelligent ? PS – there is a distnct correlation between the nationality of the agencies and the corporations / obligors they rate most highly. I have no idea why anyone this side of teh pond pays any attention to them – other tahn for aforementioned reasons. The big society? I just don’t get it. As an idea, it hardly recived a ringing endorsement from the voters. Remember, the tories did’nt win the election. I believe the majority of people are decent and willing to perform individual acts to help others – to do shopping for the old lady next door etc. But the idea that countless people are poised to march in and take over community projects is just that –an idea. It’s not an idea based on facts or research – just a notion dreamed up by somebody. Like someone said earlier, it’s like John Major’s “back to basics” and we all remember what happened to that! Oh yeah, and that other great visionary thing – getting drivers to report unnecessary plastic motorway cones. I agere with your comments re the BS. The idea is just bullsh*t.
As I understand it the Big Society is not compulsory so if you don’t like the idea, don’t take part. Not every community will want to or be able to take part but that is a part of local decision making. It won’t solve all of our problems but just attacking it because it’s Cameron’s or Letwin’s idea is just destructive. Both the right and the left are critcising the idea so IMO it must have some merit. The right are suspicious of society yet praise the spirit of the Blitz, neighbourhood watch and National Service. As for the left isn’t this just an extension of the co-operative movement that you value so highly? @roland – the ‘my family’ thing is the increasing tendency I’ve noticed for parents to want ‘the best for our child/children’ even if that means trampling over other people’s offspring. It’s the competitive parent thing, which I am sure has got worse. Of course, no every family is like this by any means, but its often said that having children broadens ones horizons. Unfortunately I’ve seen too many examples of where the opposite seems to happen. @Paul HJ – agree re ratings agencies. The investment head of HSBC has openly questioned why we need them. @Aleksander – I noticed the Chinese agency and thought it an interesting development. It’s part of Chinese attempts to flex their financial muscle. The US needs to watch out. In ten years time there will be a new dominant economy and the dollar will cease to be the automatic reserve currency. that’s when US debt hits the fan and the price they pay for oil really gets painful. They’ll be pleading with BP to open up that pesky well. I totally agree with your forecast. It is history repeating itself. The British Empire mortgaged itself to the US in WW1 and their fortunes switched. The US empire has mortgaged itself in its pursuit of consumerism to China and the switch over is irreversible. The West is going to have to lower its standard of living while the new economies raise their’s. All these discussions about the deficit and cuts are just us re-arranging the deck chairs. Iceberg ahead. More history repeating itself. Someone has cornered the cocoa market. Reminds me of the Bunker Hunt’s cornering silver in the early 80s and that ended in tears. So it’s After Eight’s all round then?